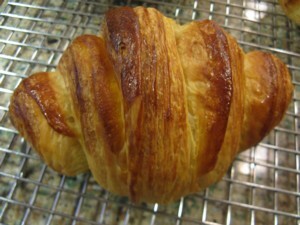 Hello, I've been wanting to make croissants for years. 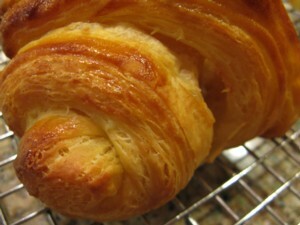 hansjoakim's recent post and getting a copy of Ciril Hitz's Baking Artisan Pastries and Breads spurred me into action. 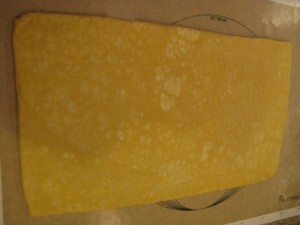 I tried using a tutove rolling pin for the first tri-fold. 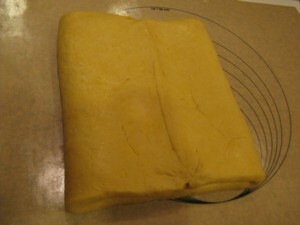 I had some dough/butters layers happening, then unhappening, as the pictures show - poor temperature control & butter likely being too cold. 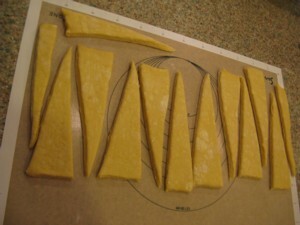 For final shaping, I don't think I rolled the dough thin enough; triangles were cut somewhat unevenly; this all shows up in the final proof and bake. The kitchen was warm this morning due to other baking - I don't think this helped things either so the final proof happened in a cooler part of the house...but I still had butter leaking out during the bake. Look wonderful to me! I love the shaping. 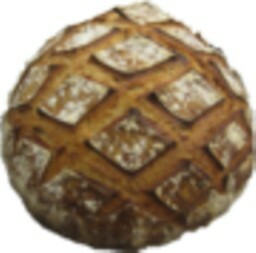 Breadsong! 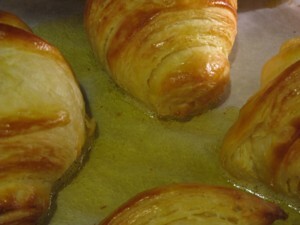 are those your first shot at croissants!! You're very talented..! 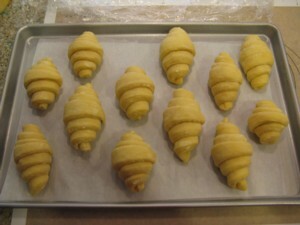 Thye look very nice croissants! 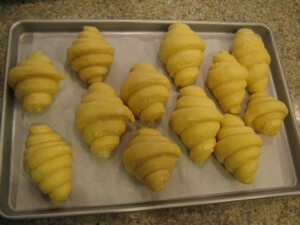 It is very difficult for me to make such perfect croissants like yours!! 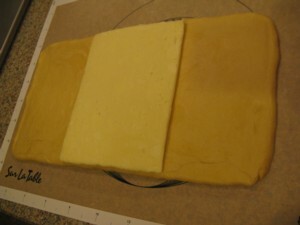 Butter breaking during the rolling isn't so bad. 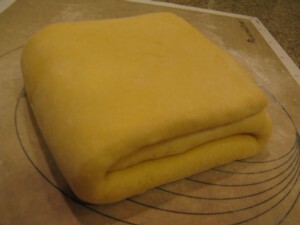 Butter melting into the dough during rolling is bad. A 1/4" thickness is best. 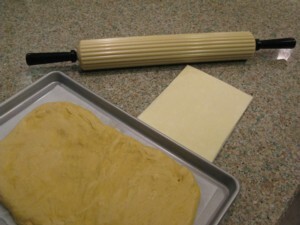 To lessen butter leaking during baking, preheat the oven at 475 F. Use two baking sheets on top of each other to prevent over-browning at the bottom. Bake for 5 minutes and then turn down to 400 F and bake for 5 minutes. 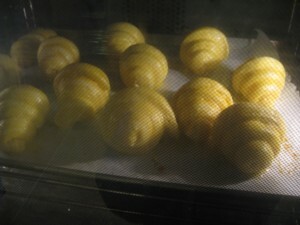 Then turn down the oven to 350 F and bake for 5 to 10 minutes until the insides are thoroughly baked. It's good that you proofed them in a cool temperature. 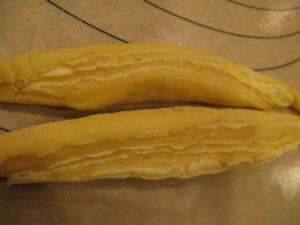 Actually, it's better proofing them at a cool temperature for a couple or few hours. You get better height and flakiness. 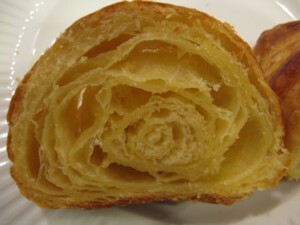 I just bought some croissants from an excellent french bakery...and yours look even better!! arlo, mebake and akiko...thanks for your compliments. I didn't know how these would turn out on my first try and I am encouraged by your kind words. lazybaker...thanks for the temp guide for baking. 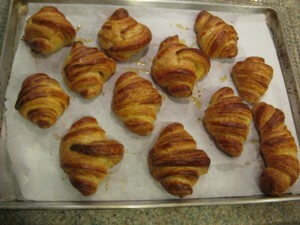 These were baked at 380F convection for 5 min then turned down to 360F convection for the balance of the bake. I'll try your suggestion next time...I really want to keep all the good butter IN the croissant after all the work it took to get it there! Daisy_A...thank you for the link - I bet there's really good information there! I really liked the instruction in Mr. Hitz's book and look forward to reading more on TFL too. Pam...if you were, I'd put the coffee on!